Vehicle shoppers looking for a brand that can deliver the most bang for their buck turn to Hyundai for its affordable price tags, generous feature packages, and competitive warranties. One vehicle in the lineup that never disappoints is the Hyundai Tucson crossover. Built with plenty of room for the whole family and all of the gear that comes with them, the Hyundai Tucson makes family hauling or weekend adventures less of a hassle. 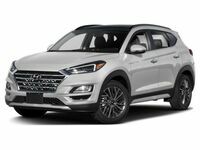 For the 2019 model year, the Hyundai Tucson got a mid-size refresh with a new exterior grille, updates to the center console and driver controls, and additional active safety features on all trim levels. With more connectivity and amenities than ever before, the 2019 Hyundai Tucson is delivering drivers a comfortable and connected experience each time they climb behind the wheel. The 2019 Hyundai Tucson lineup is available for test drives, lease, and purchase at select Chris Auffenberg dealership locations including Auffenberg Hyundai Cape Girardeau in Cape Girardeau, MO. Browse available models online now using the link below. The 2019 Hyundai Tucson’s model year revisions brought a lot of new features to the table including increased active safety on all trims. We highlighted some of the best standard and available features found on the 2019 Hyundai Tucson crossover below. Vehicle shoppers in the Cape Girardeau, MO area can find the 2019 Hyundai Tucson lineup at Auffenberg Hyundai Cape Girardeau. Connect with our team using the pop-up form below to schedule a test drive or browse our current inventory online now.